In Bone House, a square central panel, made of paint-soaked carpet stretched across a small canvas, is surrounded by a chaotic, woundlike space of red rags and white-painted cow rib bones. 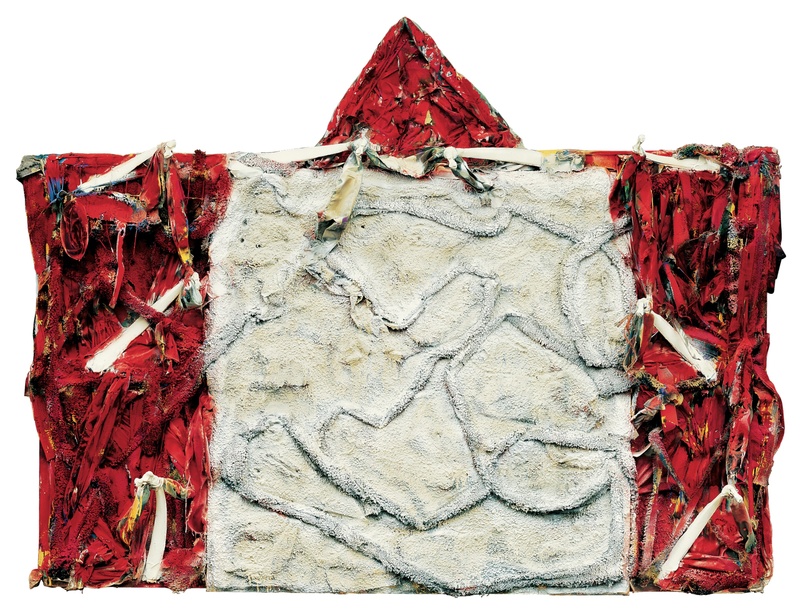 In Bone House, a square central panel, made of paint-soaked carpet stretched across a small canvas, is surrounded by a chaotic, woundlike space of red rags and white-painted cow rib bones. A rooflike red triangle surmounts the white square to identify it as a house, where a female figure has been painted in off-white. Is the white square “bone house” a bandage? A tombstone? An emblem of Dial’s art? Like Dial’s other ontological works, Bone House pulses with overlapping questions about life, death, and art.